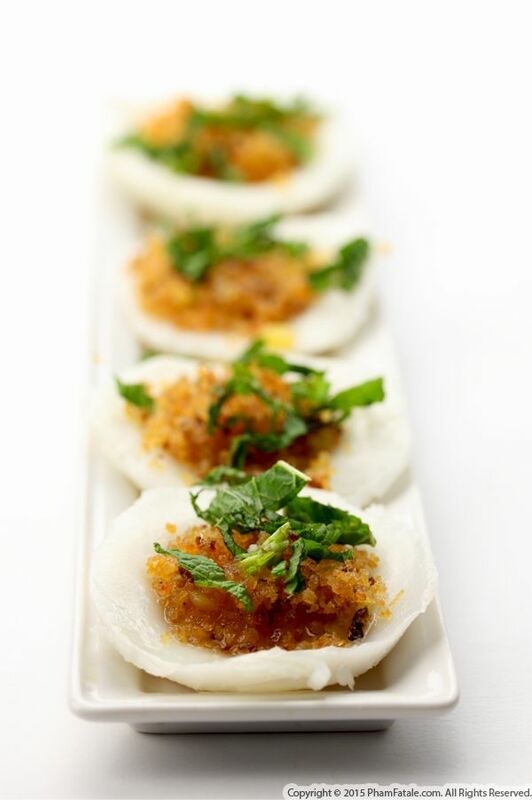 Bánh bèo is a Vietnamese specialty made with individual, thick, steamed rice cakes. The recipe is not that complicated but preparing each rice cake can be time-consuming. The batter is made from combined rice flour, tapioca starch and corn starch. I used tiny, one-ounce porcelain dipping bowls to steam the rice cakes. Once they were cooked, I brushed them with onion-flavored oil to prevent them from sticking to each other. Little Aria helped with brushing the rices cakes with oil while I unmolded them; it made the preparation all the more fun to have her around, getting her hands dirty. The second step is the filling, which is traditionally made with dried shrimp flakes, fried shallots and green onions. 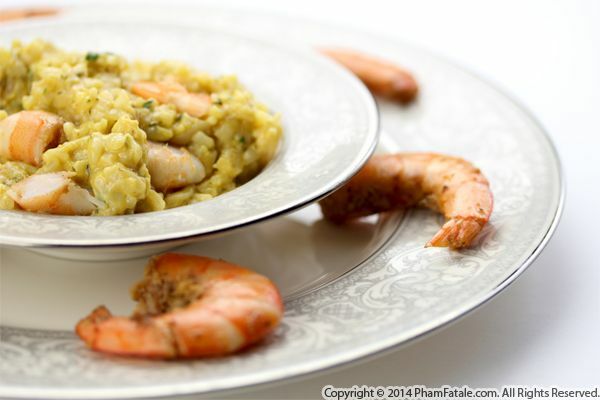 You could make a vegetarian version using mung beans. Lastly, a drizzle of nước chấm (fish sauce) and chopped Vietnamese mint (rau thơm) complete the festive dish. Shrimp is a food that people who celebrate the Asian New Year's Day commonly eat during the festivities. I'm planning on making dumplings and spring rolls with shrimp this week and I bought extra so I could prepare other dishes as well. This weekend, I prepared shrimp risotto for little Aria. I think the shrimp added a bit of pizzaz to the risotto. All I did was caramelize garlic shrimp as a first step and continued cooking the rice in the same pan. Just writing about it makes my mouth water! It may look fancy but the dish is fairly easy to make and has a wonderful flavor. So if you come across fresh shrimp at your local grocery store, be sure to give this recipe a try! 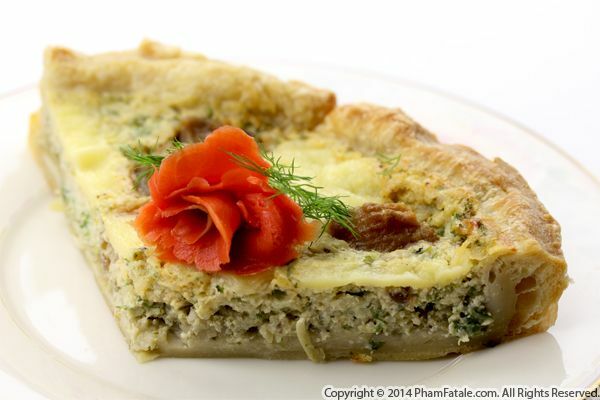 Savory tarts are a great option for a light meal. Yesterday I prepared one of little Aria's favorites. The open-faced tart was filled with smoked salmon, marinated artichokes, pearl onions, ricotta cheese and dill. Paired with mixed greens, we enjoyed a wonderful, refined meal that could possibly be suitable for a Valentine's Day meal if you feel like serving food a bit out of the ordinary and want something extra tasty. 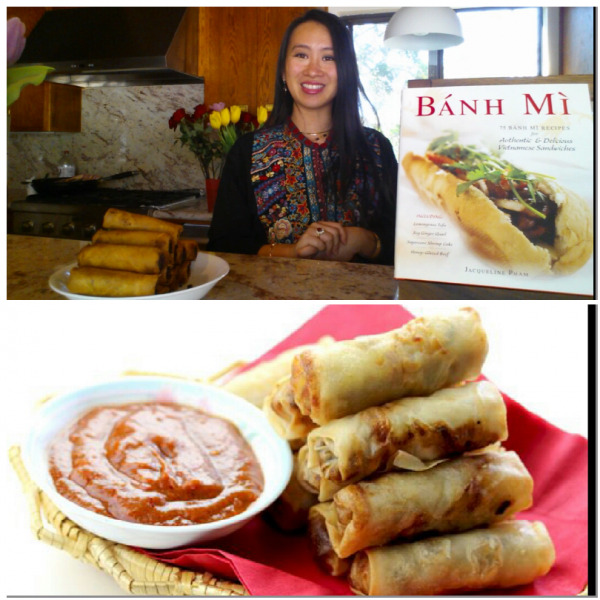 With the Vietnamese New Year festivities starting tomorrow, I'd like to share some of my favorite Asian dishes with you. As I've mentioned many times, there is a tradition of abstaining from meat from the day before the new year through the day after. With as many vegetarians as I have in my home, I always find myself coming up with new variations on Vietnamese dishes. The first ceremony is starting tomorrow. It's called "đưa ông Táo". It means farewelling the Kitchen God to the heaven. I'm preparing an elaborate display to pay respect to the gods and to our ancestors, and only vegetarian food will suffice. I also listed a lot of festive dishes that I love. Maman used to prepare so many marvelous seafood dishes for Tết (on the 19th of February this year). I hope you'll find a lot of inspiration in this post. Israeli couscous, also known as Middle Eastern couscous or pearl couscous, is a great alternative to potatoes, rice or pasta. I served the less-common starch with oysters and marinated artichokes as a starter during a recent dinner party. 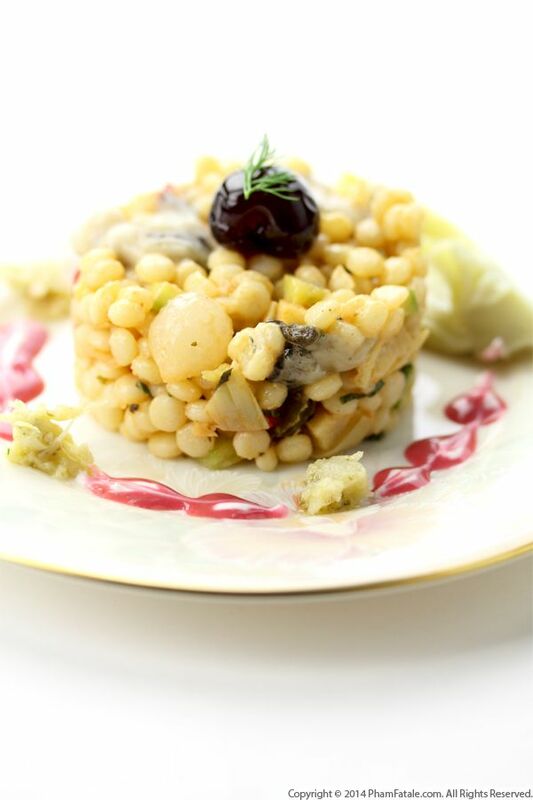 I served the Israeli couscous salad with wild cherry-flavored red pepper and walnut sauce, which complements the dish wonderfully and provides a pleasant color contrast. Page 28 of 28 pages. Copyright © 2019 PhamFatale.com. All Rights Reserved.